Waking up to such view from our Inn in Haputale was just a bliss. But rather than chilling in our room. We decided to check out Lipton's seat. There is a van/mini bus (50rp Per person) that goes directly to a nearest village to Lipton's seat. And its VERY VERY FAR TO walk up to Lipton's Seat from there. The mini bus will stop you at a junction and from there again you would need to walk about 2-3km uphill. Upon entering , the entrance fee is 50rp per person. The Best time to visit is in the Morning. We came the day before in the afternoon and it was all misty and rainy. Indeed the weather was clear and gorgeous. There , a shop is selling tea for only 40Rp. 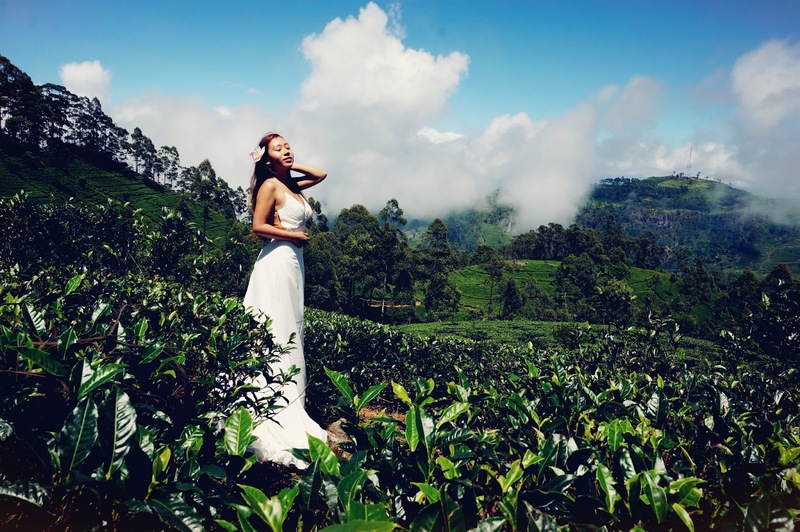 Just sit down and enjoy their ceylon tea with the view. And here I customized my own easy to wear Saree. A Local complimented how creative this idea was ! And We didnt missed out taking our pre-wedding photos here as well! Don't miss out Lipton's Seat !